It was a rough start to the IMCA Sport Compact feature. As the field took the green flag, Jason Berg broke his driveshaft, causing his race car to make contact with Dylan Sandberg and Andy Reed. The contact between Berg and Sandberg ended their night early but Reed was able to continue. On the complete restart, Reed, Stan Tho mpson, Josh Houn and Chance Seelye raced four wide for second. However, there was not enough room on the race track and there was contact as they took the green flag, leaving Houn spinning on the frontstretch. Josh Roehrich slipped by leader Alex Thompson on the second complete restart. Alex Thompson quickly faded, losing positions to Reed and Stan Thompson and Chase Schlafmann. Schlafmann, who left the race track to get parts for his broken race car, passed Stan Thompson and Reed just before a caution for the slow car of Seelye. Drivers extended their time limit and track officials ended the feature five laps short. 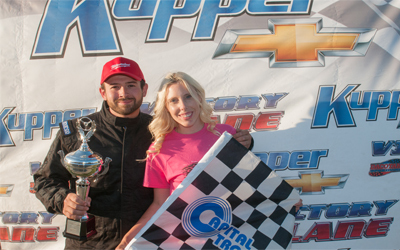 Roehrich led all five laps to win his third feature victory of the season. Chase Schlafmann finished a season best of second ahead of Stan Thompson, Andy Reed and Kody Stoxen. Pole sitter, Roy Erickson, got loose on the start of the Hobby Stock feature and outside pole sitter, Josh Roehrich slipped into the top spot. As Roehrich came to lead the first lap, Roehrich got loose off turn four allowing Wyatt Rath-Wald to close in on his rear bumper. Rath-Wald took the lead on lap three, bringing John Gartner Jr with him. Roehrich had his hands full as he tried to hold off Jeremy Engelhardt and Brent Vetter. As Rath-Wald started to pull away from the field, Gartner Jr started to feel pressure from Engelhardt, Roehrich and Vetter. As they battled for second, Vetter shuffled into second. As Engelhardt raced Roehrich for fourth, Engelhardt over drove turn four, dropping to seventh with four laps to go. Roehrich, now trying to hold off Nathan Messer, drifted up the track and into Messer, causing a caution. Rath-Wald led the field to the restart as Vetter dove low into turn one. 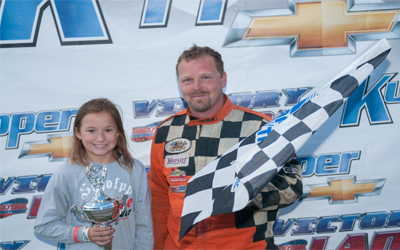 However, Rath-Wald was strong on the highside of the track and held on to win his third feature victory of the season. 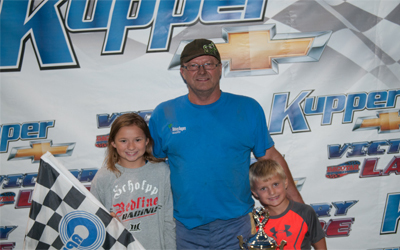 Brent Vetter had to settle for second ahead of John Gartner Jr. Jaren Wald, who filled in for Keith McCleary, finished fourth as Jeremy Engelhardt came back to finish fifth. Pole sitter Austin Wiest led from the pole in the INEX Legends feature. As Austin Wiest continued to lead, Kevin Jensen and Tom Wagner battled for second. 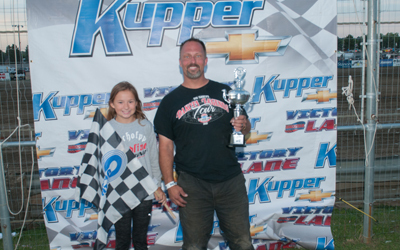 They raced hard, allowing Troy Hoff to quickly catch and pass them for second. Hoff and Wagner reeled in leader Austin Wiest and it was a three wide battle for the lead. Hoff shuffled in to the lead but had his hands full with a strong Shane Williams, who started 12th, took the lead with seven laps to go. Wagner started to fade as the laps wound down, losing positions to Drew Papke, Dauntee Martin and Donavin Wiest. With two laps to go, points leader Donavin Wiest passed Martin for fourth where he would finish. Drew Papke finished third behind Troy Hoff. 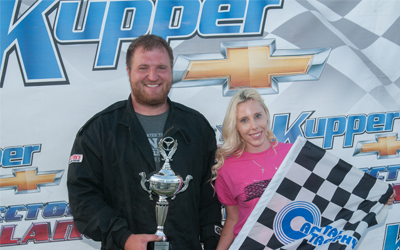 Minot, North Dakota's Shane Williams picked up his second feature win of the season at the Dacotah Speedway. Dickinson, North Dakota's Hunter Domagala started on the pole for the WISSOTA Street Stock feature. Domagala led the first lap before Matt Dosch blew by on the outside to take the lead on lap two. Dosch was super strong on the high side and he started to pull away from the field. It was a race for the second as Domagala tried to hold off Allen Frederick, Zach Frederick and Shawn Volk. They raced side by side for much of the race, shuffling for position. Volk, who found speed along side the guardrail, grabbed second. However, caution regrouped the field with five laps to go. Dosch pulled away on the restart but caution came out once again when Domagala spun out in turn one racing for second. On the final restart, Dosch went low to block Volk for the win, opening the door on the outside for Chris Michaelsohn. They raced three wide for the the win. As they crossed the Open Road Honda finish line, it was almost too close to call but Michaelsohn won the feature by an inch, preventing Dosch from winning his first career WISSOTA Street Stock feature. Shawn Volk, finished third ahead of Zach and Allen Frederick. After a complete restart in the IMCA Modified feature, Josh Rogotski grabbed the lead from pole sitter Herb Bargmann. Bargmann quickly fell through the field, losing positions to Tim Perkins, Hank Berry and Brent Schlafmann. Spencer Wilson and Mark Dahl passed Schlafmann for fourth as Perkins started to catch the leader, Rogotski. Rogotski, got too high off turn four, allowing Perkins and Berry to slip by. They raced side by side for the lead until Berry completed the pass on lap 10. Berry started to pull away as Wilson passed Rogotski for third, bringing Chandler, Arizona's Ricky Thorton Jr with him. Wilson and Thorton caught Perkins for second and passed him with five to go. Perkins fell into the clutches of Shawn Strand and Cody Laney of Torrance, California. Perkins couldn't hang on as finished sixth behind Cody Laney. Shawn Strand, who started 16th, finished fourth. Ricky Thorton Jr passed Spencer Wilson at the finish line to finish second behind feature winner Hank Berry.